Q: I have 4 angel eye rings, 2 on each side per headlight. Do I need more than 1 set of BMW Angel Eyes? A: You only one set of BMW Angel Eyes. Each BMW LED Ring Marker Bulb will power up both rings for each headlight lamp. 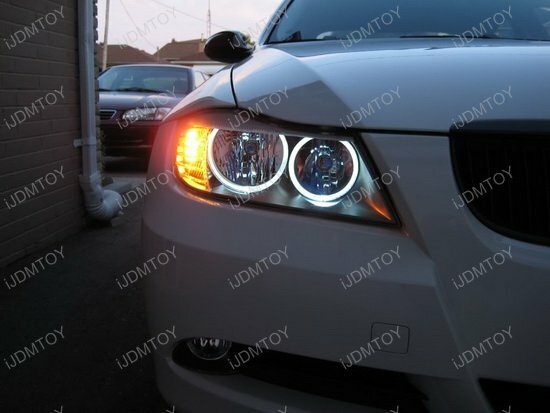 Q: Are these LED BMW Angel Eye error free? A: Yes, the BMW Angel Eyes have can-bus decoders built-in to be 100% error free for the BMW vehicles listed on the product description page. 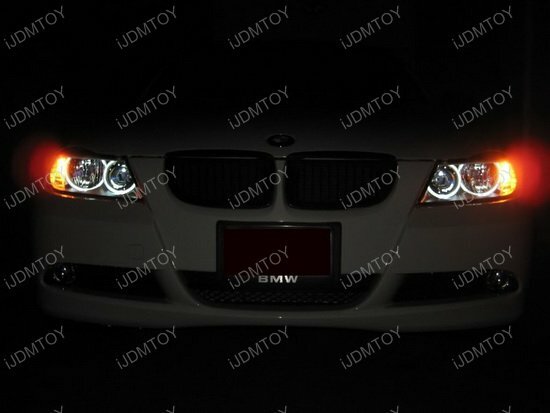 Q: Are these LED BMW Angel Eyes available in any other colors? 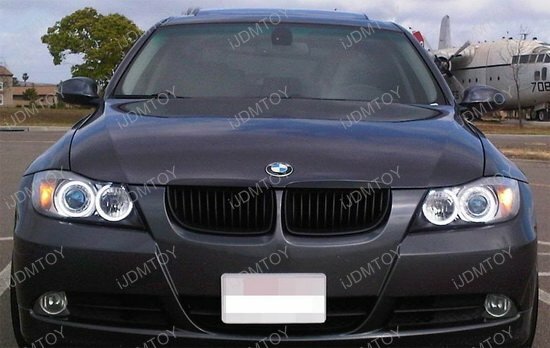 A: No, we only carry these BMW Angel Eyes in the 7000K Xenon White color which is the only legal color for street use. 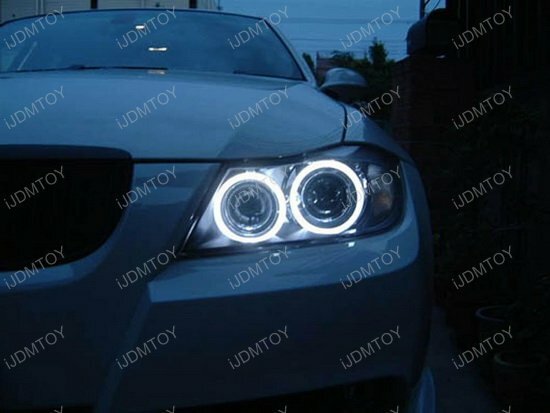 Q: What's the wattage of this BMW Angel Eyes? A: Each BMW Angel Eye LED bulb is rated at 20W. 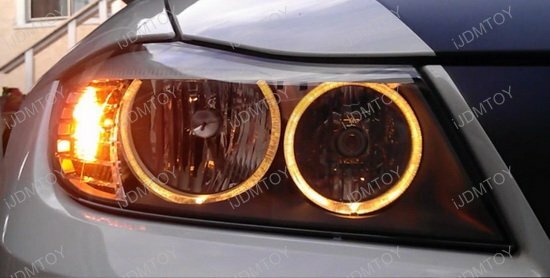 Q: Are there any modifications required to install this BMW Angel Eyes? A: No modifications are required, this BMW Angel Eyes are simply plug and play. 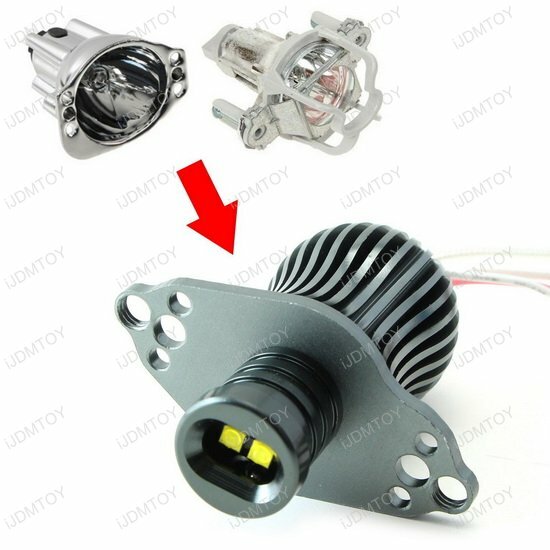 Q: Can I install these LED BMW Angel Eyes to my BMW which only has the standard halogen headlights? A: No, these BMW Angel Eyes will only fit the BMW vehicles listed on the product description page WITH factory equipped HID xenon headlights ONLY. 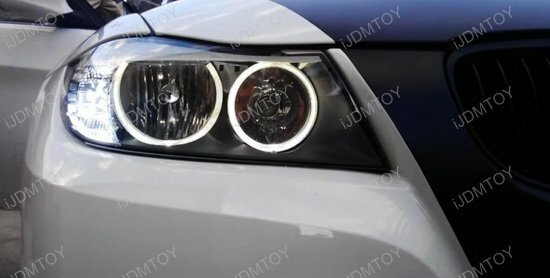 Q: Will these high power LED BMW Angel Eyes be as bright as the stock BMW LED angel eyes on these 2011+ models such as 3 Series Coupe and 5 Series GT? A: No, these LED BMW Angel Eyes will not be as bright as the newer BMW angel eyes due to different design of the lights, but will still be a nice upgrade in color and light intensity from your stock dull yellow incandescent bulbs. 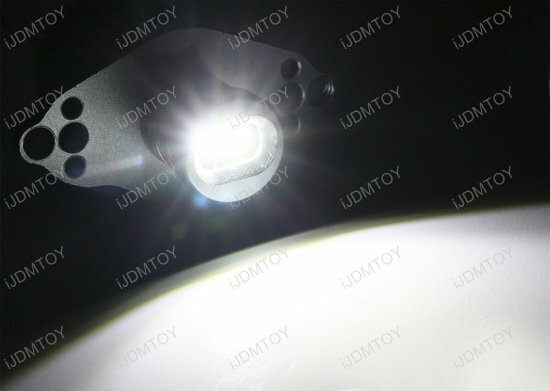 Q: How come during the daytime, the LED BMW Angel Eyes appear dimmer and not noticeable? A: Since the LED is rated at 7000K xenon white, the color spectrum is very close to the sunlight during daytime and especially under the sunshine. As a result, it will appear dimmer than the stock yellow angel eyes, but this appearance will be only last during the daytime. Q: How come the adapters are different from my original plugs? A: LCI stands for life cycle impulse and it's made up of changes to the BMW during its production run. This allows for freshening a model without a complete design overhaul. An LCI retains the basic styling and platform of a car but has aesthetic alterations such as changes to the fron fascia (grille, headlights) taillights, bumpers etc. It may also include a change to the vehicle's name. Q: How come the LED bulb flickers/strobes a couple times when I start the engine? 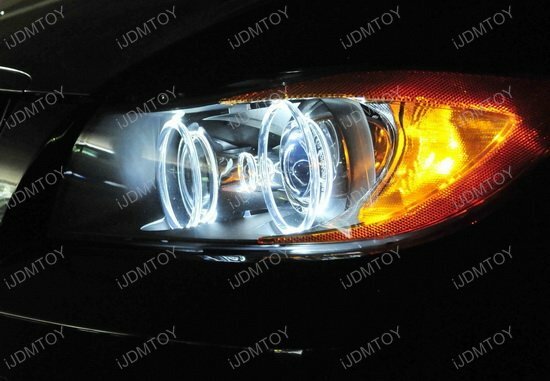 The kit includes two LED angel eye bulbs with canbus decoders. 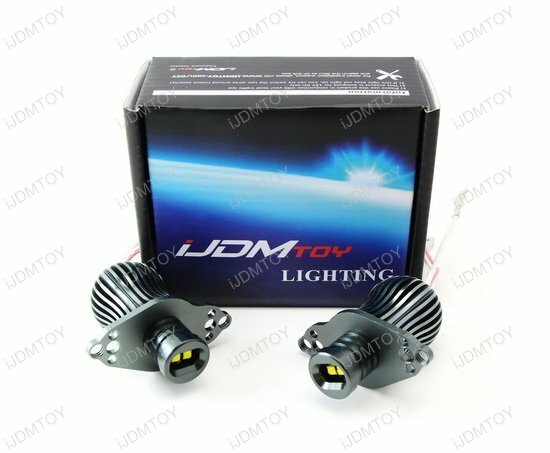 Each bulb is powered by 2 pieces of 7000k xenon white HID matching color 10W CREE LED diodes for extremely high output. The canbus decoders will ensure 100% error free when installed into your BMW. 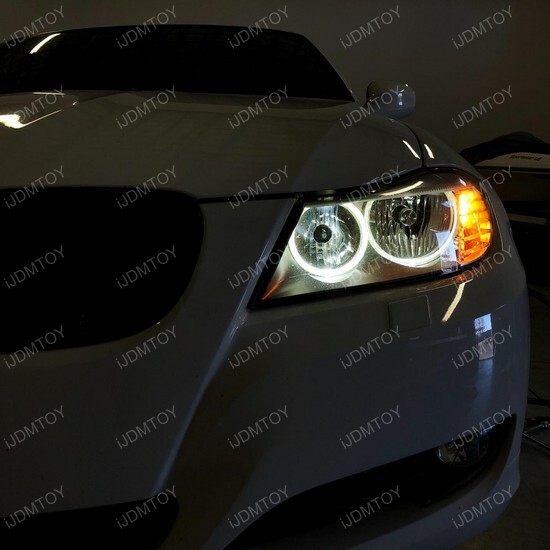 Please double check, prior to purchasing this product, that the 2006-2008 BMW 3 Series needs to have factory equipped HID headlights in order to use this product and the 2009-2012 BMW LCI 3 Series needs to have only the standard halogen headlights in order to use this product.